We’re getting closer and closer to Fall, and apple brandy is quickly working its way into my drink rotation. Autumn and apples get along splendidly, probably because it’s the harvest season, and the marriage of the two (as an idea) has worked its way into the American psyche over three centuries. Today’s drink, however, is made with calvados, applejack’s French relative with a long wonderfully complex history. Stir with ice and strain into a cocktail glass. Garnish with a maraschino cherry, if you so desire. Delicious. The Widow’s Kiss seems to be a Nostalgia Potion for all those who sip it. Ted Haigh calls it “the most evocative drink ever,” conjuring up, for him, memories of his grandmother’s trunk filled with memorabilia from a 1914 trip. Paul Clarke recalls childhood of memories of Jacqueline Kennedy. Musing over the name and the reminisces of others brings to mind a couple of Ray Bradbury stories: “Grand Theft,” an amusing, romantic tale of two long-lost lovers re-united by stolen love letters, and the somewhat sad and nostalgic “Autumn Afternoon,” which speaks of the half-remembered, blurred-together days our childhood. They’re two of my favorites. According to Haigh, the drink was first published in George Kappeler’s Modern American Drinks in 1895, later appearing in cocktail guides in the early 20th Century and then disappearing during into the vacuum of Prohibition. David Wondrich re-discovered the drink, it seems, or at least highlighted it, in Imbibe! For a little more on the history, flip through your copy of Wondrich’s essential tome or take a glance Ereich Empey’s post on the Widow’s Kiss. Now for a word on the drink components: the Calvados is a relatively recent addition to my liquor shelf, and a good bottle of the stuff remains difficult to find in the States. American apple brandy has long been a favorite of mine, particularly Laird’s 7 1/2-Year-Old Apple Brandy for sipping neat; the Boulard is comparable in flavor to the Laird’s Old, but it has a nose that, to me, resembles that of chianti, which I’ve never been enamored with. Otherwise, it’s a very enjoyable spirit, and I look forward to trying more calvados (now, if only I could get to France!). The yellow chartreuse, being less intensely herbaceous than the green variety, is floral and honey-like, and emphasizes the chianti-like nose of the calvados, while its herbal side, in combination with the Bénédictine and bitters, brings out the spicier characteristics of the calvados. 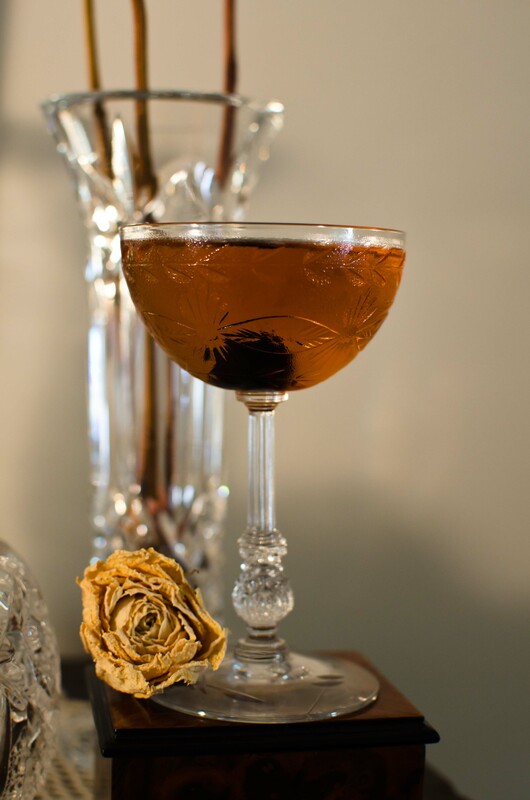 The Widow’s Kiss makes an ideal after-dinner cocktail. If I had to tinker with this one, I’d like to reduce the liqueurs to 1/2 ounce each, reducing the sweetness of the drink, an opinion I seem to share with Erik Ellestad. I’ve pulled this recipe out for tasting a bit early in the year, as it would make an excellent herbal concoction during the chilly winter months. Jay Hepburn mentions that the drink’s characteristics change slightly as it warms up, so don’t rush to gulp this one down (not that you’re likely to with those intense, monk-made liqueurs). I’ve found that many drinks served “up” do go through subtle changes as they warm, often improving in flavor and balance. 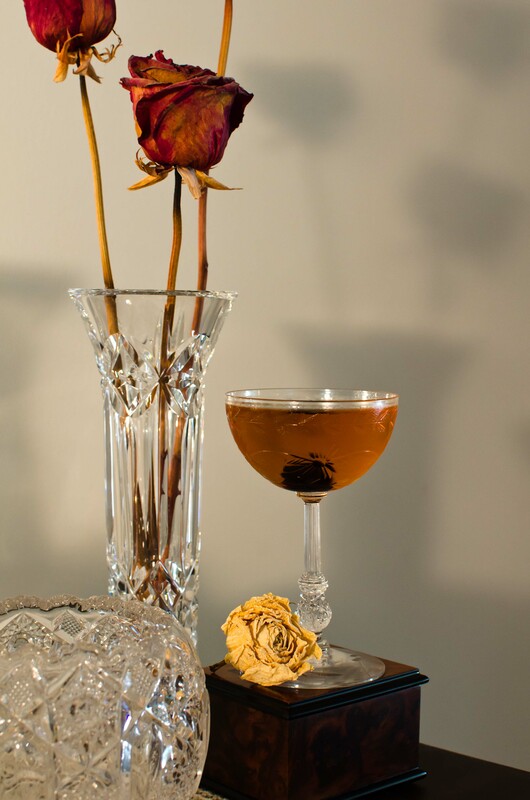 This entry was posted on September 18, 2011 by IJ Lauer in Angostura, Benedictine, Calvados, Drink Recipe, Yellow Chartreuse and tagged after-dinner, benedcitine, calvados, cocktail, david wondrich, drink, herbal, recipe, sweet, widow's kiss, yellow chartreuse.